Welcome back folks! First up on the agenda is a follow-up on my budget deckbuilding challenge, a contest I host over on the WotC boards. The contest involves combo'ing around a jank rare while keeping the budget to under a paltry ten dollars - no, that wasn't a typo! The reasoning for this limit is that many who play MTGO have a small budget to work with - one of those people happens to be me. I want to help make Magic enjoyable for all players, not just the players who can afford to drop the big bucks for the latest chase rares (not that I have anything against those who do have full-time jobs to sponsor their exploits - more power to them). You can find the thread for this contest here: boards1.wizards.com/showthread.php. This contest's centerpiece card was Grinning Totem - an overlooked Mirage rare that recently made a timeshifted appearance in Time Spiral. So after several weeks and many decklists, the vote was in and we had a winner - AJ_Impy! I've also got an exclusive interview just for you! dragonmage65: Hi, and congratulations! What do you think the hardest part about making the deck was? AJ_Impy: The hardest part tends to be innovation: figuring out how to break the card in an interesting way that no one else is likely to think of. In this case, with Grinning Totem, the card relies substantially on your opponent's deck and sacrifices itself to have any effect. In order to make full use, you'd need to have sufficient mana to cast any spell that the Totem might pull, and a means of recurring the totem. Quite a few people were going for the reliable-but-predictable Academy Ruins method, but I wanted to go for something bigger, more spectacular, more Johnny. Trying to find an original and creative use for a card with very little application is always tricky. dm65: Can you summarize the deck's strategy for our readers? AJ: Basically, it hinges on one massive turn that ends with your opponent losing. 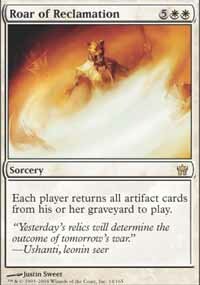 Using Outrider en-Kor and Cephalid Aristocrat to dump your library into your graveyard for free, you need to cast a Roar of Reclamation to get everything into play. What you do then depends on your opponent's deck - you're going to kill them with Grinning Totem, but there are two ways to go about that. The quick way is to sacrifice a Totem, find an X-spell if they have any, sacrifice golems until you have X= their lifetotal and wipe them off the face of the game. If they don't have any X-spells or burn, we need to deck them. One card at a time, 4 cards per iteration. This is where the Conjurer's Baubles come into play: You stack your now-2-or-3-card deck with the Roar of Reclamations from your graveyard, sac all your Totems to remove 4 cards from their deck, rinse, repeat. As for getting to this point, you need the Outrider, Aristocrat and Roar. With Demonic Collusion useful as a repeatable tutor, getting all three isn't too hard. There are enough warm bodies to provide defence in the mean time, with the golems particularily expendable. One of my favourite tricks during testing was blocking with the Aristocrat and/or Outrider, waiting for lethal damage on the stack and then emptying the library into the graveyard with a Roar at the ready the next turn. dm65: If it has one, what would you say the deck's Achilles heel is? AJ: A high mana curve. With the artifact lands vulnerable to disenchanting, an attack on the mana base can stop the deck dead before you get a chance, and an aggro deck can kill you all too quickly. dm65: Do you have any advice for any Johnny hopefuls that might happen upon this? AJ: Always look at the big picture. 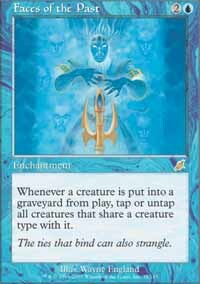 Don't just look at what a card says, look what it implies, and look how even the most obscure aspect of it can be tweaked. Remember cards with open-ended phrasing such as 'remove a counter from a card you control:beneficial effect', in that case look for cards with counters you don't want. If a card mentions a specific creature type, think of creature type changers and other means of interacting with that information. dm65: Which Johnny card would you like me to combo around right this instant? AJ: There are a number of beauties I have my eye on for Planar Chaos, but I'll be working on those myself. Let's go for the obscure Scourge rare, Faces of the Past. dm65: Thanks for your time! Well then, AJ_Impy has asked, and AJ_Impy shall receive. From now on, every time I host a budget deckbuilding challenge, I'll have the opportunity to return the favor by building my own deck, with the same strict financial constraints, around a crap rare of the winner's choice. So, then, introducing our next combo! Faces of the Past is a fairly narrow card. The 'tribal' requirement only limits its combo potential, but we shall have to make do in any case. The card can do one of two things - it can tap creatures, or it can untap them. Tapping creatures is for the control folks who play with their 60island.dec and naively expect to actually make some friends while doing it. Untapping things, on the other hand, is for real men who enjoy jacking themselves up on Red Bull twice a day. Err…perhaps not, but I trust you get the point. So then, how can we abuse the ability to untap creatures? In other words, what is it, when tapped, is worth untapping? Synopsis: This deck utilizes a nasty infinite recursion combo - Faces of the Past + Hell's Caretaker + any Horror creature + Genesis Chamber. To start it off, you'll need all four of the above in play, and you'll need another Horror creature in your graveyard. At the beginning of your upkeep, activate Hell's Caretaker targeting the creature in your graveyard, sacrificing the Horror you have in play. This triggers Faces of the Past and untaps Hell's Caretaker. 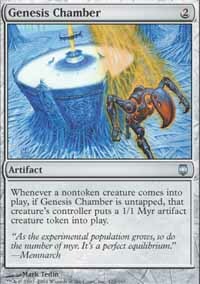 This also puts a 1/1 Myr token into play, and your Caretaker will end up untapped. Lather, rinse, and repeat to your heart's content. After you've created as many Myr as you like, you'll have to wait another turn before you can attack, unless you should choose to splash for something along the lines of Mass Hysteria. This, of course, leaves you open to global kill effects, but that's a risk you'll have to accept. You have 12 horrors in the deck in 4x Caretaker, 4x Phyrexian Rager, and 4x Frightcrawler, which should be plenty for your purposes. Dimir House Guard can fetch up your Caretakers or even your (Diabolic Tutors) if you need something else. Thought Courier gives you an outlet for discarding a Horror into your graveyard. The Concentrates are there because I love them, and the Darksteel Ingots are there because I love them too - and as if that weren't enough, they actually do something! added bonus to this matchup is that you can be sure that they won't be packing Wrath of God. Versus Everything Else: You're on your own here - just look out for removal and stay away from falling behind. I am on board with the Cabal Therapy, I think it would be a great sideboard card if not maindeck. the first time is like a look into the fog but if you flash it back it shouldn't be a problem especially if you can just recurse everything.. I really like the deckbuilding challenge, I hope you continue them. I was happy to see AJ win it, since not many people tried to stay away from the ruins. The Combo-Wish deck looks interessting. Actually, the article just seems shorter because the decklists are more condensed. In reality it's quite a bit longer than previous ones. Brain Pry isn't a great fit for the second deck because it doesn't particularly do much if you don't know what your opponent is playing, meaning that at best it's just a cantrip for 2 mana. I'll take your word on that. My argument for Brain Pry is that at 2 mana you can pretty much ensure that what you're doing won't be disrupted (unless they top deck), which allows you a bit more security when going off. Not bad, not bad at all, although I might advise switching the Concentrates for a draw card that gets you discarding, to give you another outlet to get a horror in the grave. A good range of questions asked. Ah, but how do you deal with the problem once you know it exists? Cabal Therapy would be infinitely better than Brain Pry for sure, since you can actually get rid of the problem before it becomes one. I liked the deck :) I'm a fan of combos any day ever!